View More In Magnetic Field Therapy - Page 4. Our Magnetic Therapy Mattress Pads and pillow pads contain powerful ceramic ferrite magnets (manufacturer's gauss rating of 3650 - 3950 per magnet Bio-North negative facing the body). 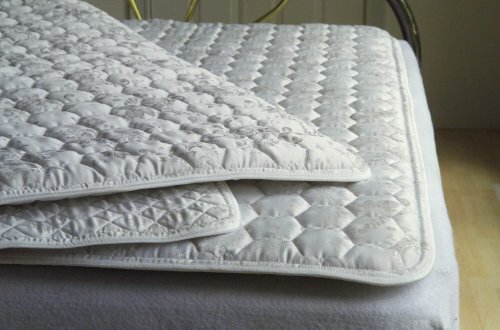 The damask quilted mattress pad fits on top of your mattress and under your fitted sheet to project a north-pole field along your entire body. It has been our experience after 22 years of manufacturing, that Ceramic Magnets create the best sleep environment. Our strategically placed magnets coupled with magnet size allows for optimum performance of magnetic lines of flux to penetrate up into the body. Studies have shown that Magnetic Therapy is suggested to help improve sleep patterns, increase energy levels, improve circulation, reduce inflammation, and is suggested to soothe aches and discomfort. We at ProMagnet make no medicals claims to the benefits of using magnetic therapy. Please note: This product is personal in nature, therefore we cannot accept any returns or exchanges if you have pets or animals or if anyone in your home is a smoker. For non smokers and non pet owners we offer a 45-day money back guarantee. Your return must be received within 45 days from the date of your invoice. Please click on "view shipping rates and policies". ProMagnet offers a one year manufacturing warranty against defects. Warranty does not cover neglect or misuse of a product, or normal wear and tear. Returns must be free from any type of tear, burn, smoke aroma, odor, animal hair, dirt, or stains. If you return your product according to these conditions, a credit will be issued minus shipping costs. To clean your pad you can spot clean or have it professionally dry cleaned. We proudly manufacture our own products here in the USA. (230) 3/4" dia. North oriented Ceramic ferrite magnets 3,950 gauss each. High-quality, soft quilted damask fabric with non-slide backing. Shipping cost is based strictly on size of container and weight. No handling fees applied.